What do you do when you can’t stop thinking about something you want to buy? The first month of our 6 month no spend challenge threw a few curveballs, the biggest one to me was the temptation of a dress in my favourite store. It looked fantastic on, the fabric was beautiful and the dress was high quality. Fortunately, they didn’t have my size, it was on sale and sold out online so there was no chance of getting it. I have not stopped thinking about it though. We had some preplanned travel for some family events and I was so fixated on this dress that on this trip, I popped into the shops to see if the dress was there, but alas, it wasn’t. I am lucky though because as much as I wanted this dress I didn’t want to break my no spend challenge and I did not want to have to confess a major blowout. Clearly, my behaviour showed I was doing the opposite of what I truly wanted. We all get tempted and if we slip up, it’s ok. Accept it, stop the behaviour that is not in line with your goals and get back to what you set out to do. 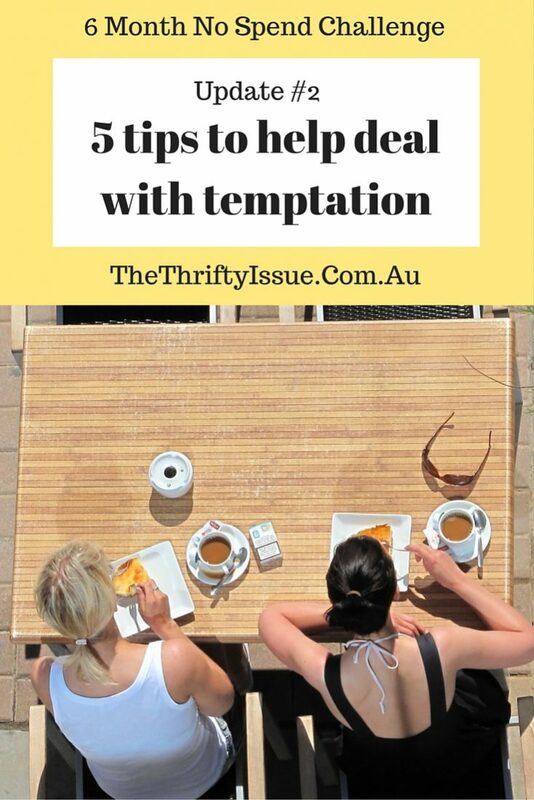 I’m sharing this, because no one is perfect all the time and while I live by my 10 tips to help you stop spending, it doesn’t mean I don’t get tempted! Whatever it is that tempts you, have a goal in mind with a solid plan to work around it. In my case I’m on a no spend challenge, so spending money can be the temptation. Your temptation might be food, or alcohol or bingeing on NetFlix that you want to stop. My goal is a 6 month no spend challenge. I have outlined my plan in this post, however on top of that I need to include other measures to reduce the temptation to shop such as avoiding the shopping, choosing to shop at the markets with a strict shopping list cash only and leaving my cards at home, having someone I am accountable to (this includes all you lovely readers), having planned treats at designated times during my challenge e.g I have a restaurant giftcard we can use for a family dinner one night and a few similar options I am spacing out in my challenge to reduce the feeling of deprivation. 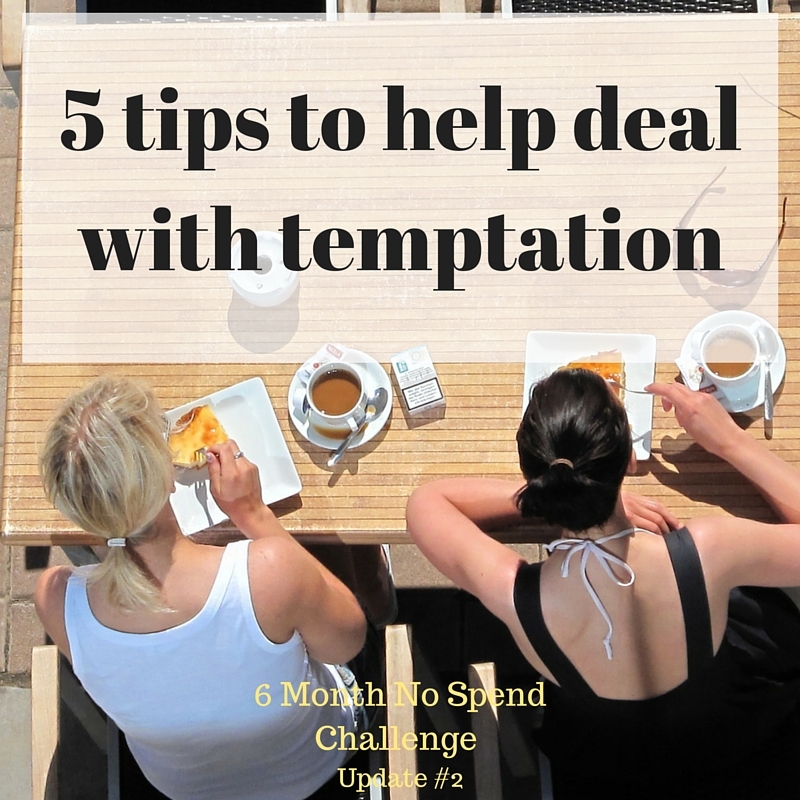 A clear plan of action with a specific goal makes it easier to handle temptation when it arises. With my no spend challenge to avoid temptation I avoid the shops, I plan out our groceries as mentioned and have made meetings be in offices instead of local cafes. It is not entirely possible to avoid temptation of every sort. For example, if you are trying to have a healthier lifestyle and avoid cake or other junk food, when an office birthday happens and there is cake in the lunch room or a friend insists on a chocolate cafe to meet at or there is a fundraiser involving food you feel pressured to participate in, it can be hard to avoid it without coming off as rude or damaging relationships. With the office party, if there are healthy food options stick to them or offer to bring a platter of vegetable sticks and crackers. Eat well before you go ensuring you’ve had breakfast and/or lunch depending on the time the party is and focus on your goal. If you cannot avoid having any of the cake, take the smallest piece possible. If you cannot avoid the temptation completely find ways to work around it. Distraction is sometimes all you need to take your mind off whatever it is you want. Take up a new hobby, call a friend or join in a conversation on social media. Do something other than shop or eat or whatever it is that is tempting you. Commit to not doing whatever it is you are tempted to do for 20 minutes. Try to change your focus, then at the end of the 20 minuted the temptation may have passed, you might have distracted yourself or the opportunity might have gone. If not, push for another 20 minutes. Try to remind yourself the temptation will pass, focus on your goal and control your urges. Don’t beat yourself up if you do give in to temptation. Rectify whatever it is you need to as best you can, be responsible for your actions and do what you need to do to fix the situation and reduce your temptation in the future. The dress was not my only curveball this month. On top of my dress temptation, I have been offered a good opportunity in September, part way through my challenge and it is going to cost me around $638! The opportunity itself is an invite only 3day conference in Canberra. All expenses are covered except travel to and from the conference. On top of flights, I need to arrange childcare and transport to and from the airport. Canberra doesn’t have a train or bus option from the airport to the city like Sydney and Melbourne leaving the only option of a taxi. I was invited and unable to attend last year so am pleased to be invited again. It is an incredible event for networking and collaborations. My flights and the taxi are a business expense, the childcare is not. So while it is technically excluded as it is a business expense, it is still an unexpected expense and as I am committed to this challenge, I wanted to get creative with how I would manage it. At this stage, I plan to go. The event happens to coincide with another event I had bought tickets for (also a business expense). I chose to sell these tickets for the amount I paid – $185USD each which resulted in $247AUD for each ticket, a total of $494AUD. – Bus instead of fly. The bus would cost $150 to $180 return compared to $300 on flights, plus the bus eliminates the airport transfers and drops me right near the conference. However, it takes 8 to 9 hours each way on the bus vs 6 hours total with flying (travel to and from the airport, waiting before my flights and flight time.) That is around 10 to 12 hours longer. Potential savings up to $288. – Arranging a lift from a family member from Canberra airport to my hotel and vice versa in Canberra, if they are available if I chose to fly. Potential savings of $100. – Do a childcare swap with another parent at my daughters school. Potential savings $200. If I catch the bus and do a childcare swap it will cost only $150 to $180 depending on which ticket I select. This means, after selling my tickets for $494 I will be in front $314 to $344, although that is money that both goes into and comes out of my business not my personal accounts. Other notes from our challenge. Overall, I feel we have done well with our no spend challenge. I have sold the tickets I mentioned in the post but am yet to make the purchase for the September conference. We had a preplanned trip to our family this month as well. I forgot to mention it in my original no spend challenge post. We drove from Melbourne to Canberra, spent the weekend there, attended a ball and a few other events, picked up stuff from my parents garage I had stored there then travelled on to Bathurst to my partners family where we stayed a few days then drove home. The ball and events were prepaid, I wore a ball dress I already had and did my own hair and makeup. The petrol expense was preplanned and we stayed within our regular grocery budget for other food. Getting items out of storage from my parents place prompted a review of what we have in our home here. It is incredible how quickly you can accumulate things, not always through purchases but through people giving you stuff, your kids collecting things etc. I listed a few things on eBay and made $125. I have more to list next month. I’m pretty happy with how the challenge is going. Not only are we spending less, we have made money in a few little areas. I’ll be starting a money making challenge to go alongside my no spend challenge soon. Have you done a no spend challenge? How long for? What temptation came up for you? 10 ways to make $1,000 this month! I have never done a no spend challenge but I am good with saving. I don’t impulse buy and if I do, it is few and far between. The tips you have mentioned are great tools. Most actually work with breaking any habit which is handy! Good luck on your trip!! You are definitely stretching your creativity muscles and I like the tip about meeting in offices.